Event details: Did you know that 75% of us have not had end of life discussions, and that 60% think we don’t talk about death enough? This fascinating and valuable seminar will explore how the yoga tradition understands and deals with the subject of death. The wisdom of the yoga texts will serve as a resource to provide insight into how we can best prepare for a fearless and peaceful departure. Event details: Everyone on this earth shares two experiences: we are born and we die. Someone dies about every 20 seconds. Most of us know someone who has died. But we do not generally like to think about death or talk about death or even acknowledge that we all die. Around the world throughout the ages, death has always been a source of mystery and fear. Event details: In collaboration with South Brisbane PHN, Hopewell Hospice and Quality of Care Collaborative - Australia (QuoCCA), Qld Compassionate Communities (the community arm of Palliative Care Queensland) is delighted to invite you to its 2018 Queensland Palliative Care Film Night in South Brisbane. With formal proceedings kicking off at 6:30pm, we recommend arriving a little earlier to find the best seat! Event details: In collaboration with the Connecting End of Life Care in Townsville project, Townsville Hospital and Health Service Palliative Care Unit, Hopewell Hospice and Quality of Care Collaborative - Australia (QuoCCA), Qld Compassionate Communities (the community arm of Palliative Care Queensland) is delighted to invite you to its 2018 Queensland Palliative Care Film Night in Townsville. With formal proceedings kicking off at 6.30pm, we recommend arriving a little earlier to find the best seat! Event details: In collaboration with Central Queensland, Wide Bay, Sunshine Coast PHN, Hopewell Hospice and Quality of Care Collaborative - Australia (QuoCCA), Qld Compassionate Communities (the community arm of Palliative Care Queensland) is delighted to invite you to its 2018 Queensland Palliative Care Film Night in Bundaberg. Event details: Love In Our Own Time is a documentary that addresses the big things in life: birth, love and death. Holding a 21st Century mirror to who we are, the film follows ordinary Australians, bearing witness to lives beginning and ending, and capturing moments, both simple and sublime, that compose the lives we lead. This is a journey to the heart of what it is to be human, giving us pause to reflect on the lives we lead. Event details: In collaboration with Connecting End of Life Care in Cairns project, Hopewell Hospice and Quality of Care Collaborative - Australia (QuoCCA), Qld Compassionate Communities (the community arm of Palliative Care Queensland) is delighted to invite you to its 2018 Queensland Palliative Care Film Night in Cairns. Event details: In collaboration with Hopewell Hospice and Quality of Care Collaborative - Australia (QuoCCA), Qld Compassionate Communities (the community arm of Palliative Care Queensland) is delighted to invite you to its 2018 Queensland Palliative Care Film Night on the Gold Coast. Event details: In collaboration with Connecting End of Life Care in Mackay project, Mater Misericordiae Mackay Hospital, Hopewell Hospice and Quality of Care Collaborative - Australia (QuoCCA), Qld Compassionate Communities (the community arm of Palliative Care Queensland) is delighted to invite you to its 2018 Queensland Palliative Care Film Night in Mackay. Event details: In collaboration with Central Queensland, Wide Bay, Sunshine Coast PHN, Sunshine Coast Hospital and Health Service, Garland Waddington Solicitors, Hopewell Hospice and Quality of Care Collaborative - Australia (QuoCCA), Qld Compassionate Communities (the community arm of Palliative Care Queensland) is delighted to invite you to its 2018 Queensland Palliative Care Film Night on the Sunshine Coast. Event details: The Tribute Tree will be an opportunity to pause, reflect and honour the life of the loved one by writing down a memory, poem or letter and adding this message to the tree. The Tribute tree will be manned by RBWH palliative care staff, cancer care staff, advance care planning staff and staff from the Centre for Palliative Care Research and Education. We aim to promote conversations about death and dying, advance care planning and end of life care and share resources and information. Event details: In collaboration with Central Queensland, Wide Bay, Sunshine Coast PHN, Central Queensland Hospital and Health Service, Hopewell Hospice and Quality of Care Collaborative - Australia (QuoCCA), Qld Compassionate Communities (the community arm of Palliative Care Queensland) is delighted to invite you to its 2018 Queensland Palliative Care Film Night in Rockhampton. Event details: Stall with Dying to Know Day Resources, free sausage sizzle, group of health professionals available to discuss Advanced Care Planning. The stall will be held on the main street in Longreach and will capture locals doing their shopping at IGA, the lunch time rush, and capture other health professionals also, to promote and discuss Advanced Care Planning with them also. Event details: panel of experienced health professionals-Dr Sue Colen palliative consultant, The venerable Tenzin Chodron Karuna, Michelle Linton RN / Health directive expert , Sarah Winch PHD, medical ethicist and author, and Annette Lourigan death ritual expert. Venue address: 377 Scarborough road , Scarborough. This event is Ignite Talks Sunshine Coast #3 and is specifically themed for "Dying to Know Day". Food/drinks available for purchase from hotel restaurant. Event details: Join us for morning tea to discuss death, dying and bereavement and how we can help people make the most of their finite lives. A panel of experienced providers will be on hand to answer questions and provide information to both the community and health care professionals. Event name: Myth busting and FAQs - on death and dying. How to start conversations around dying and death. Planning and preparation before death. After death care and funeral arranging. Event details: "No Regrets" is a workshop using postcards, words and simple images to acknowledge challenges and triumphs throughout life. Using seasons as a metaphor in a therapeutic art activity (no art experience necessary) we will explore connection and community. This workshop supports awareness and empowered conversations around death and dying. Event name: Dying to Know stall. Event time: 9am to 4.30 pm. Event details: A stall will be held at Stockland Shopping Centre near Coles. Come along to talk about end of life planning, enduring power of attorney and dying. Venue address: Stockland Shopping Centre, Earlville. Cairns. 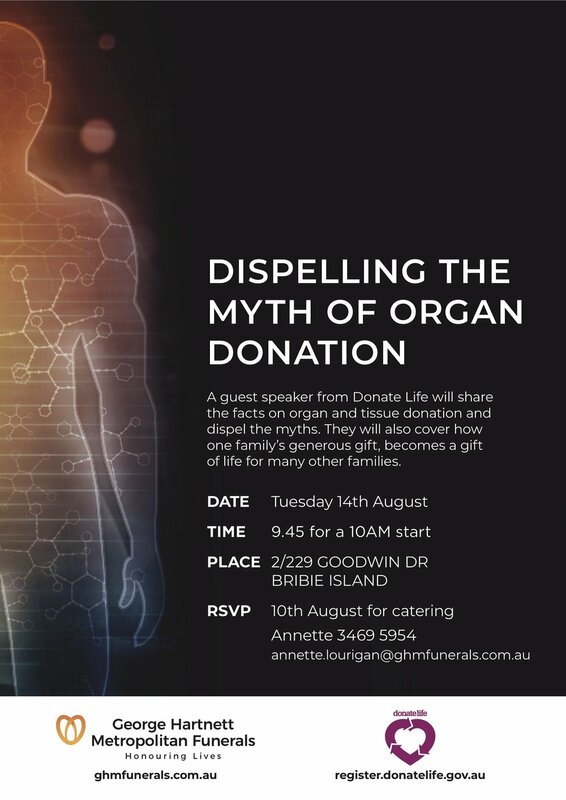 Event details:Join us for Gympie's first Death Cafe. We'll be celebrating Dying to Know Day with a conversation with Gympie palliative care nurse and death doula Carolyn Mandersloot. Carolyn specialises in working with people who are wanting to die at home. She works with a community nursing service but can also see that there are areas that we do not service that are lacking in adequate knowledge on how to care and access services to support their loved ones at home. 70% of Australians say they would like to die at home but only 14% manage to. She would love to see that everyone is able to die in their place of choice. This is your opportunity to listen and ask any question that you are 'dying to know' but have never had the chance to ask. Carolyn loves her work in our community and will answer your questions with warmth, compassion and humor. Event details: Have you written your end of life wishes down? Why? Why Not? Who have you told? Join us for coffee, cake and group-directed discussion about all things death, dying and bereavement. A time to share experiences and complete your 'wish list'.